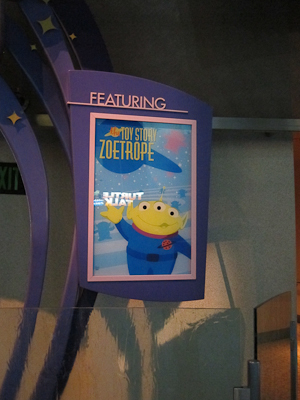 The Toy Story Zoetrope is another attraction within the Disney Animation building at the mouse-next-door. 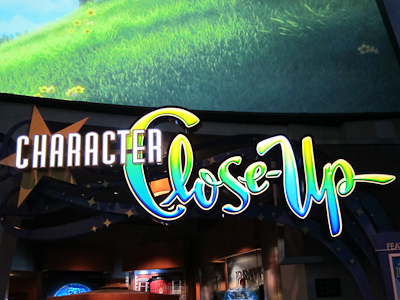 You can find it in the Character Close-Up section. I took this close-up picture of the Character Close Up. Because it's close. And up. Get it? A little green man points the way. And speaking of Little Green Men, this is completely unrelated to me or MYWTM in every way, but I absolutely love this flash mob of little green men. And they’re one of the best choreographed flash mobs I’ve seen! I think one day I need to organize a MYWTM flash mob. What do you think? Maybe everyone could buy a churro and do an awesome dance. Anyway, back to the zoetrope. Because really? Zoo-ee-trope? Zo-ee-trope? Zo-ee-tro-pee? Zoo-ee-trop-ah? Zo-trope? A couple of different ways. Hey, it’s Google, okay? But most results seem to agree that it’s ZOH-uh-trope with some weighing in as ZOH-ee-trope. So let’s just call it the Toy Story spinner thingy. A zoetrope is a precursor to film animation in which an open-topped drum has slots in the side, and you put in a strip of paper (or whatever) with incrementally changing images, and when spun and viewed through the slots, it creates the illusion of motion. 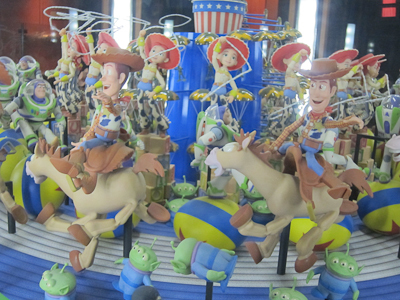 Woody, Jessie, Little Green Men, etc. The Little Green Men bounce around at the bottom. I love that. The room is darkened and the zoetrope spins rapidly, and then there’s a strobe light effect that replaces the slots found in other zoetropes, which brings the figures to action. No, I don't have one of those cool high-speed cameras. 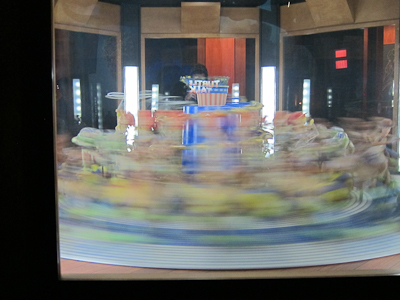 To be completely honest, the full-fledged zoetrope is not for the faint of stomach. The motion and strobe lights can be a bit overwhelming if you tend to be on the nauseous side. Still, the detail is fabulous and the moving drum is actually really cool to see. Plus the Little Green Men. I just saw this for the first time a few weeks ago. I agree, looking at it can make a person a bit queasy. I found putting my sunglasses on really helped. Pretty neat thing to check out though, while you’re waiting for Crush. Oh I remember the zoetrope! It was mesmerizing. There is a scene in that movie “Coraline” where the jumping mice are dancing that weirdly reminds me of the zoetrope at WDW. We would totally join your flash mob if it means we get a churro! 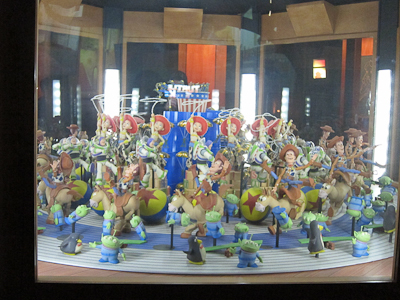 Fun fact: this zoetrope (or a replica) originally appeared at the Oakland Museum a couple of years ago as part of the exhibit “Pixar: 25 Years of Animation,” which also featured pre-production artwork and models.